The Victor is a landmark apartment development situated in the coastal suburb of Browns Bay in Auckland. 4Sight was engaged by Civic Torwin Construction Ltd to develop an out of the box landscape plan for the development that suited its surroundings and overall design of the building. 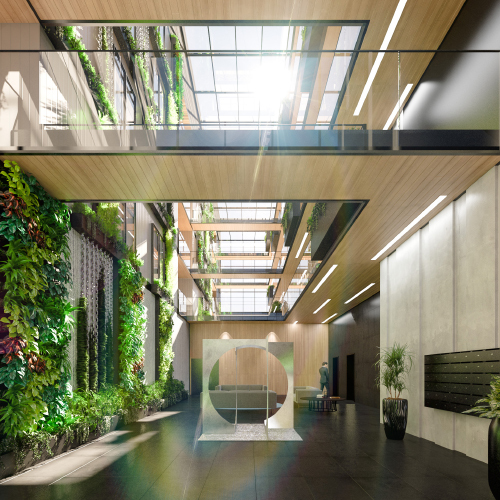 An emphasis on design, quality and incorporating innovative green wall and landscape treatments throughout the interior and exterior environments of this stunning building has been the main focus of the entire project. Renée Davies, a principal Landscape Architect here at 4Sight, has been involved in the entire process from its inception to collaborating with the broader design team to develop a landscape strategy and living systems assessment. 4Sight are continuing to collaborate on this project and are currently undertaking the detailed design of the exterior laneway and providing expert oversight and review of the green wall system design and implementation, including plant selection.